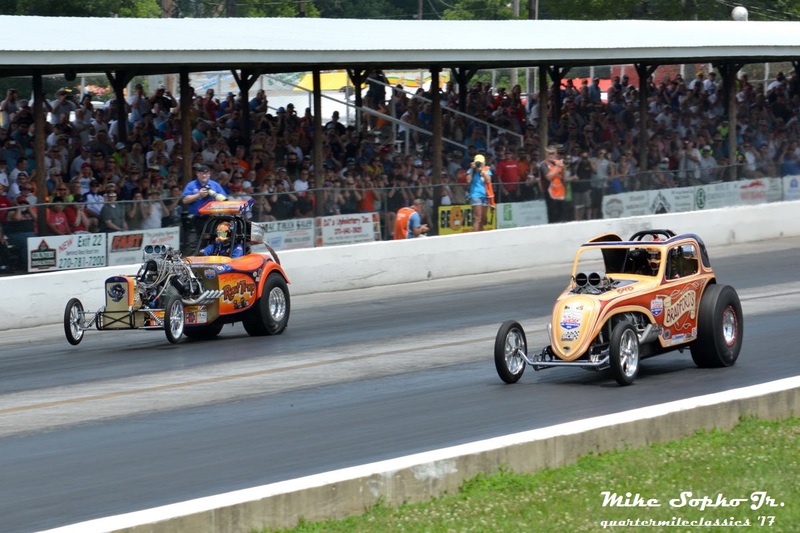 As Father’s Day rolls around each year nostalgia fans in the Midwest flock to Beech Bend Raceway Park in Bowling Green, Kentucky for the annual National Hot Rod Reunion. With this annual reunion racers and fans alike can always count on the appearance of beautiful street rods and muscle cars, vintage slingshots, funnies, altereds, and gassers, as well as an occasional shower and some hot and humid weather, though it is well worth it to attend this annual happening. 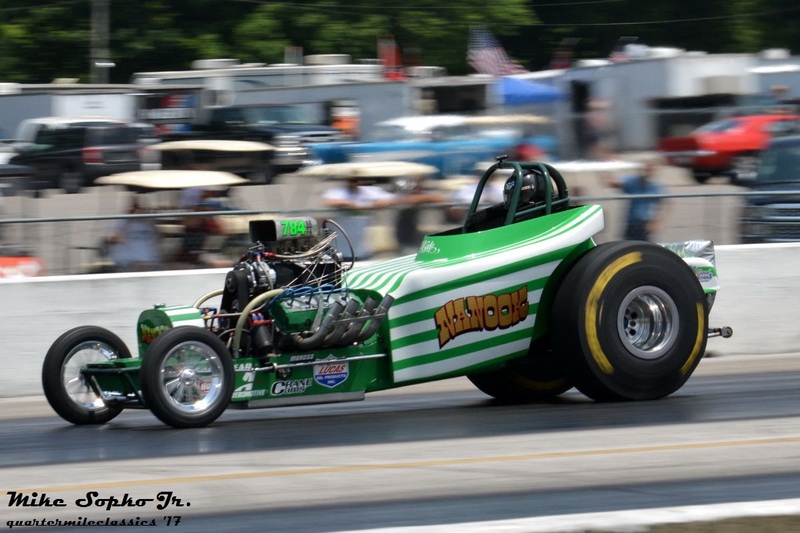 Something else fans were treated to this year was an outstanding crop of Nostalgia Top Fuel dragsters. At times overshadowed by their flopper peers, some could argue that Nostalgia Top Fuel has taken a back seat to the funnies as car counts in funnies have been substantially higher. Furthering that point is that in years past there have been barely enough cars to fill the 8 car field. However, this year 12 fuelers made an appearance including the usual big hitters from the west coast. Coming from out west were Mendy Fry in the “High Speed Motorsports” dragster, Jim Murphy in the “WW2” tuned by Roland Leong, Adam Sorokin in the “Champion Speed Shop Entry,” and Dusty Green in the “Nitor-Hemi.” The Midwest was well represented by Diamond Dave Miller, Tim Cullinan, Jason Greenwood, Tyler Hilton in the “Great Expectations” fueler, and Jim Young in the “Young Guns.” Other entries included Paul Shultz in the “Spirt of Tulsa” dragster from Oklahoma, Julius Hughes in the “Atlanta Speed Shop” dragster from (well…duh) Atlanta, Georgia, and the reigning N/TF champion from New York “T-Bone” Tony Bartone in his “Bartone Bros.” rail with the gold number one emblazoned on the side. A very close first round match pairng Sorokin and Bartone. Sorokin eventually lost the lead and the blower. Remember when I said there were a few things fans and racers could always count on and one of those was the occasional shower. Well that is exactly how the event started off on Thursday. With what was supposed to be just a small shower lasting for about a half hour turned into a severe thunderstorm lasting over three hours long, pushing all of the time trials back. 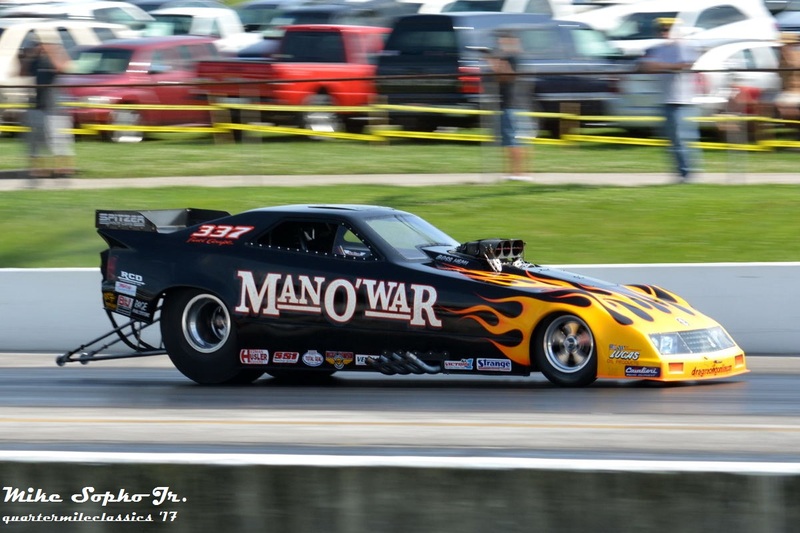 Top Fuel was supposed to hit the track at 3:00, but not a single car made it onto the 1320 till sometime after 3:00. To the NHRA’s credit, though the track was scheduled to be secured by 6:00 in the evening they gave everyone one shot at the track including the fuelers who did not run until around 9:00 in the evening, thus treating the fans to nitro at night! 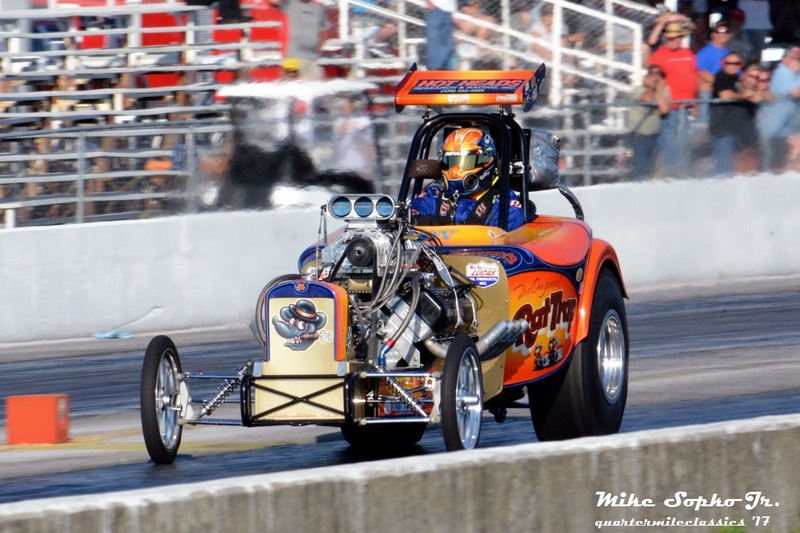 Jim Young threw down the gauntlet in the first pair when he recorded a 5.68 at 243, the only dragster to run in the 5 second range on Thursday evening. In fact, Young’s Thursday night run would have held up as the number one qualified run for the event, but that wasn’t good enough for the team hailing from Wisconsin. Rumor had it that on Friday they were trying to step up and run in the 5.50’s. Young knocked on the door of the 50’s, but ultimately ran about 7 hundredths quicker than Thursday night’s run with a 5.618 at 260 mph. Only two other cars would make it into the 5.60 range with Murphy and Fry each running a 69. Other qualifiers included Bartone (5.72), Sorokin (5.88 on fire), Green (5.91), Dave Miller (6.04), and Tyler Hilton (6.10). Eliminations Saturday began with Young versus Hilton; two of the Midwesterners squaring off. Both cars suffered from traction issues with Hilton going up in smoke and Young having to pedal through tire shake. Young recovered much quicker and turned in a 5.99 to Hilton’s slower 6.90. The next pair saw Fry take out Green with a 5.71 to a 6.17. Murphy was scheduled to run Miller next, but Miller could not make the call and thus Hughes was installed into the field. Murphy lead from start to finish and took the convincing win with a 5.72 to a losing 6.38. The last pair saw last year’s champ Sorokin tangle with national champ Bartone. For most of the run you could have thrown a blanket over the two as Sorokin held a slim early lead. 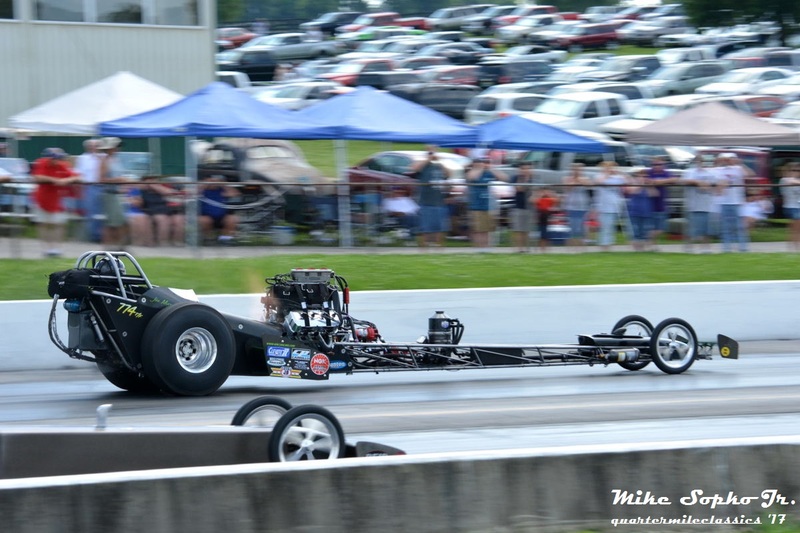 Unfortunately mechanical gremlins again set in for the Champion Speed Shop team and grenaded another blower near the finish line allowing Bartone to move around with a 5.71 to a losing 5.73. Going into the second round three of the four cars ran either a 5.71 or a 5.72 with number one qualifier Young the slowest at a 5.99. Young would square off with Bartone while Fry and Murphy, who each qualified with a .69 and ran a .71 and a .72 respectively in the first round, would face one another. First up were Murphy and Fry. As both cars passed me at about 300 feet Murphy had a car lengths lead which he carried with him to the finish line running a 5.73 to Fry’s 5.81. In the next pair I had my camera focused on Young in the far lane and could hear that he noticeably had to pedal the car again, meantime I was waiting to see Bartone’s dark red digger enter view. However it never happened and Young recovered to run a 5.83, while Bartone coasted down the track after an uncharacteristic double step off of the starting line. The final was set with a showdown from Murphy and Young. Though Young held low ET and top speed of the meet it was Murphy with lane choice. Murphy took the left lane, the same lane he won the previous two rounds, putting Young in the right lane in which he had not run in since Thursday evening. The question was whether or not Young could regain his performance from qualifying or if the tire shake bug would continue to plague his team. From my spot near 1,000 ft. I could again hear Young have to pedal due to tire shake. 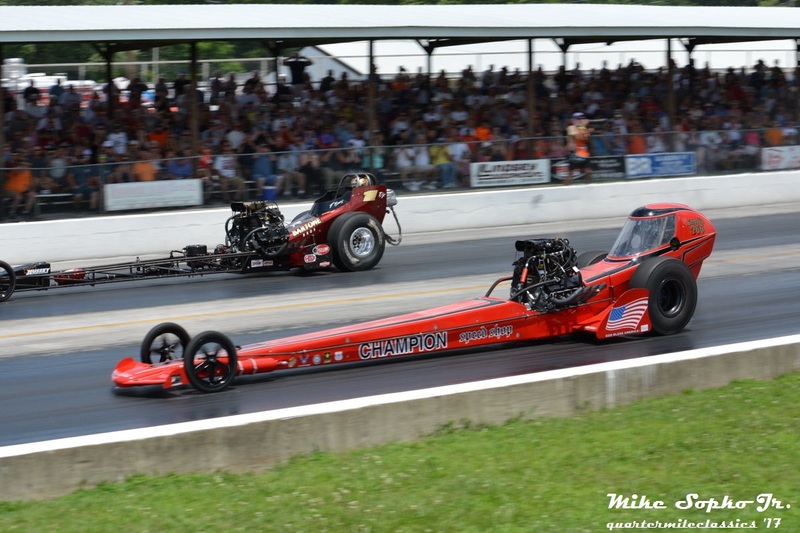 That allowed Murphy to charge past Young to take the National Hot Rod Reunion title with a 5.71 to Young’s 5.92. The "Havoc" with Nick Davies behind the butterflies, all the way from the UK. - Vince Generalao drivign the Hough family "Nanook" entry. Other nitro attendees included a booked in four car show of fuel altereds. 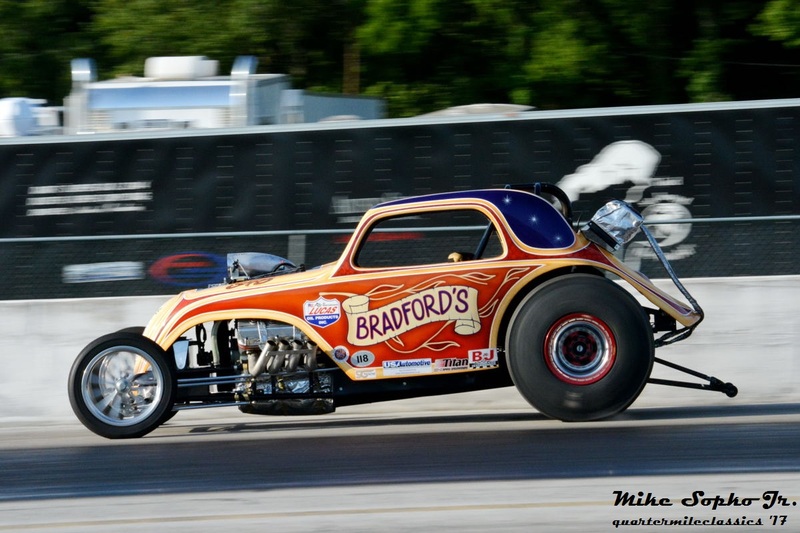 The fuel altered contingent included the Hough’s “Nanook” with Vince Generalao behind the wheel, the Hope’ family’s “Rat Trap,” the Bradford’s Fiat, and coming from the UK the Havok altered of Nick Davies and Rob Loaring . 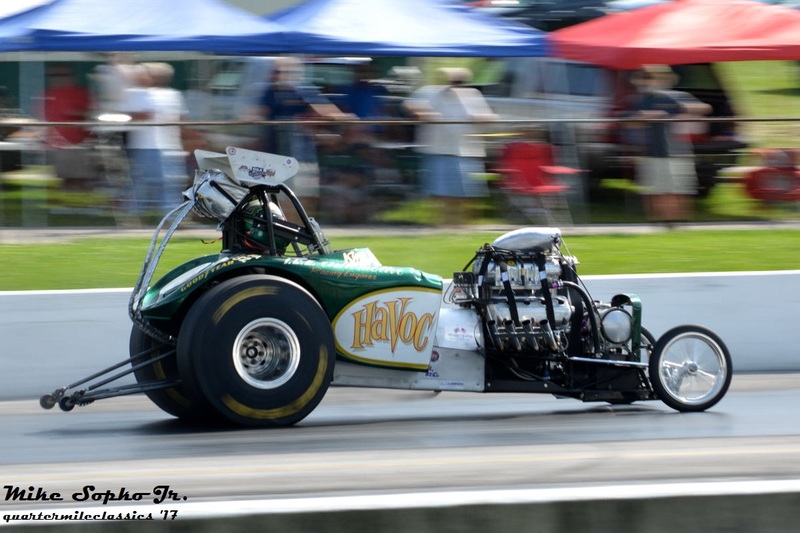 Generalao continued the family tradition with the “Nanook” teaming winning their third consecutive Fuel Altered crown at the reunion. 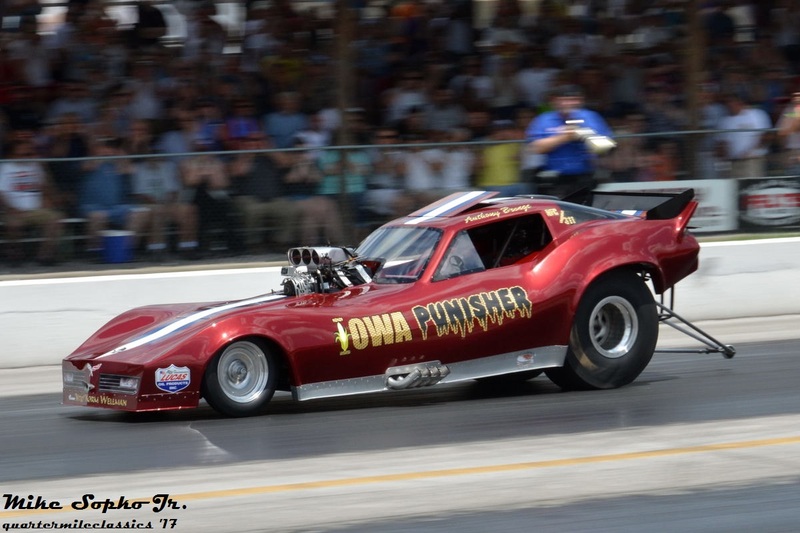 There were also four booked in funnies with Paul Romine’s “Man-O-War,” Bazz Young’s “Down Under Thunder,” Anthony Bronge in the “Iowa Punisher,” and Greg Jacobsmeyer in his “All Star Challenger.” The funnies each made one pass on Friday and Saturday and then brought the quickest two back for a final round. 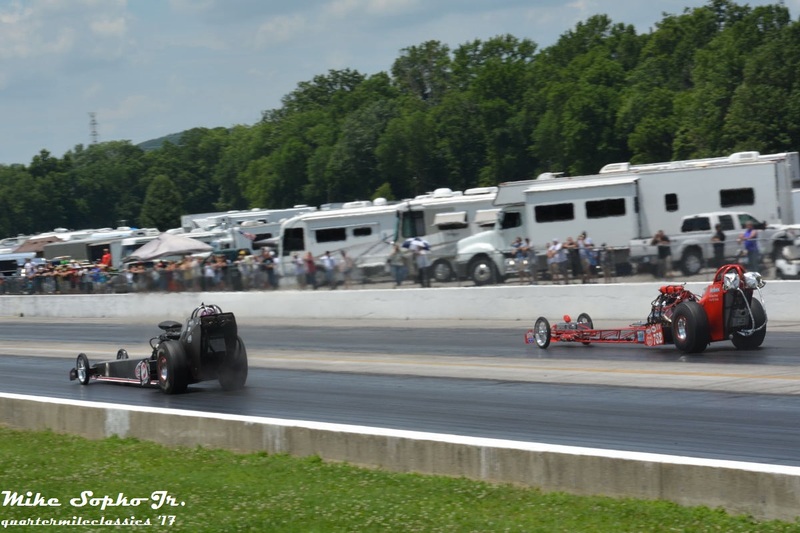 Both final rounds paired the same two cars with Romine taking on Jacobsmeyer. 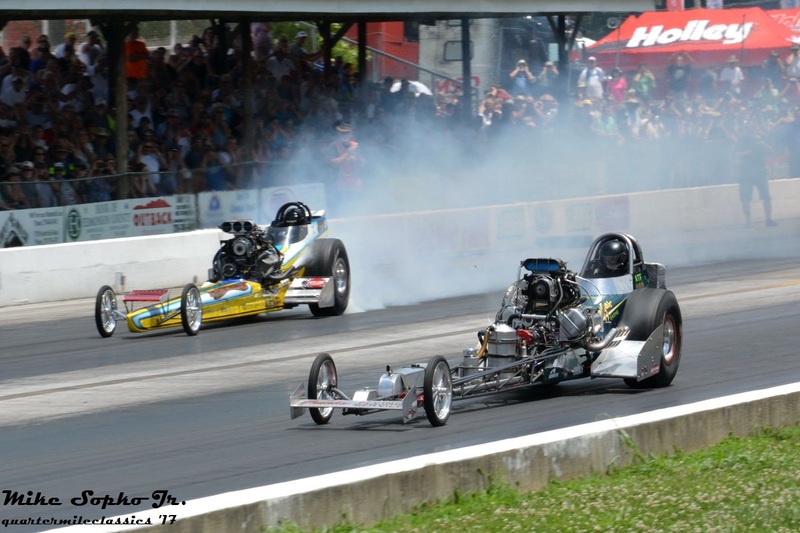 Romine had been the class of the field for the weekend running times that would have qualified him for the fuel dragster field in the mid 5.80’s. Romine took the win on Friday, but slowed to a 6 second time on Saturday giving the win to Jacobsmeyer.